Baby G's 3rd birthday is just around the corner. We plan to celebrate his birthday together with his friends at the childcare centre (.. he's not going to miss school because of his birthday; unlike Mummy, he doesn't get a birthday off.. heh heh). Over the weekend, we went down to Bugis to get all the party favours for his friends... all 28 of them. We spent less than $40 for the gifts; a good bargain, I say. Each of his friends get a packet of 6 crayons, a packet of tidbits & 2 chocolate sticks. 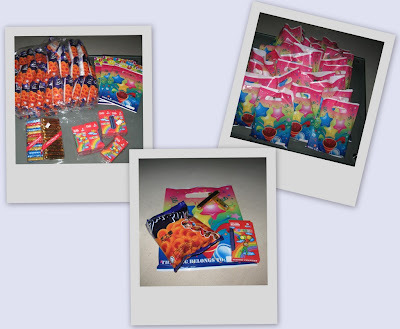 Our party favours must be both educational (crayons) & fun (tidbits & chocs). We also ordered a 'Barney' cake for him (courtesy of Gu Gu as she's not in SGP to celebrate). Hope all his friends enjoy the celebration.. but most importantly, hope Baby G enjoys his big day!